Advancing individual, family, and community health through community-engaged science. The University of Wisconsin-Milwaukee, College of Nursing’s Community-Engaged Health (CEHR) Researchers have extensive experience in community based participatory research methodologies; population health assessments and evaluation methods; and nursing informatics, and seek to improve health outcomes for vulnerable and/or low-income populations.These efforts entail multiple community partnerships and have garnered millions of dollars in research support. Our work has and continues to advance health science, policy, practice, and outcomes. Exemplars of our work are available in the areas of Health Pregnancy, Birth and Infant Outcomes; Racine Are Healthy Pregnancy Birth, and Infant Outcomes; Chronic Disease Prevention and Management; and Environmental Health. 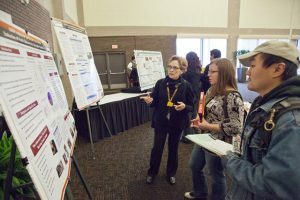 The UWM CON CEHR group first met in October, 2013 and continues to develop its practices and explore group members’ programs. The Focal Area will continue to identify members who have the qualifications and capacity for R01 or R01 equivalent submission. The CEHR Scientific Focal Area’s goal is to submit 1-3 proposals/year from a variety of funding sources. Possible funding sources include: PCORI, HWPP, HRSA, Foundations, Komen, American Cancer Society, Wisconsin Department of Health, Medical College of Wisconsin, RWJF, NIH, CDC, HWPP, and APHA. The CEHR Scientific Focal Area goal for manuscripts submitted and/or published per year is one per member. Discussion of possible collaborations will continue at the monthly meetings. There is an open invitation for presentations and discussions of members’ current and recent research studies with discussion of potential linkages to others’ research, future collaborations, or recommendations for next work.